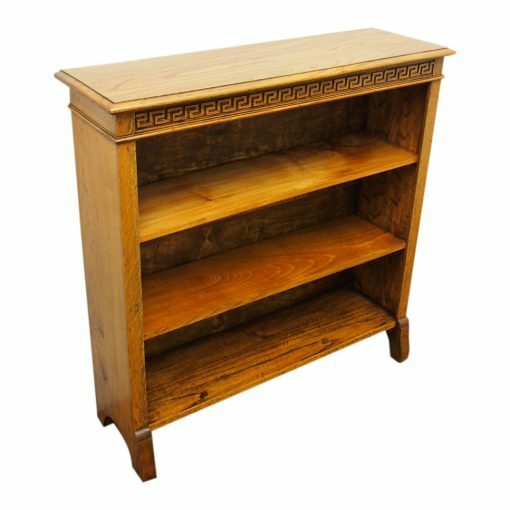 Circa 1920, neat sized golden oak open floor standing bookcase. With its solid oak top and moulded edge on the front and sides. The frieze beneath the top has a stylish Greek key pattern carved in solid oak. Beneath this is a simple beading which continues around the front and sides. The bookcase has 2 adjustable shelves plus a fixed base. At the front, there is two flat sections which are polished. As the solid gables continue down they are cut in the shape of an arch which form the feet at the front and back. At the front is an additional piece of oak with an ogee moulding, concave section and small flat section at the base giving the front of the bookcase more stability.